When North Bridge House Nursery Head Teacher Christine McLelland discovered a litter of stray kittens and their mum in her garden shed last November, she called Mayhew for help – a lucky decision which then resulted in Christine (and the kittens!) enjoying a royal audience with HRH The Duchess of Sussex earlier this month! • Back in November 2018, Ms McLelland was in her garden with her dog Fritz, when the Schnauzer alerted her to a rather unexpected surprise in the shed. • A stray cat had recently given birth there, and a litter of kittens were now living amongst her possessions. 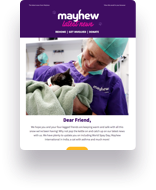 • Ms McLelland contacted Mayhew immediately, and our Animal Welfare Officers called round to collect the kittens and their mum, and bring them into our care. After sharing the news of her exciting discovery with the pupils at her school, Ms McLelland was keen to update the children on the kittens’ progress, and kept in touch. Year 1 Hazel Class asked if they could name the litter, and we were more than happy to to look after “Leo, Percy, Sasha, Mia and Tiger-Lily” until they were ready to find their forever homes! The children then decided to fundraise for Mayhew through a series of pupil-led events, book and toy sales, and have also invited our Animal Welfare Officers down to the school to give a talk in assembly. Shortly afterwards, we revealed that The Duchess of Sussex had become Mayhew’s first Royal Patron, and saw an opportunity to repay the school’s kindness and interest. We invited Ms McLelland down to our Home to meet The Duchess on HRH’s first official visit, to talk about her unexpected discovery and the children’s ongoing interest in the kittens and animal welfare. The Duchess was very keen to meet representatives from our community outreach projects and initiatives, and we couldn’t wait to share the news about our very special relationship with North Bridge House Nursery. The kittens themselves also met HRH as she took a tour of our Home, and received their very own ‘royal seal of approval’ from The Duchess – who declared them to be “so sweet”. Ms McLelland described in turn how excited she was to meet Her Royal Highness, and how happy she was that her school’s relationship with Mayhew has provided such a positive project for her pupils to be involved with. The kittens and their Mum were in all in a good condition when they were found, so after their short stay with us (being fussed over by staff as well as royalty!) we are glad to say they have all now found loving homes to go to.